What’s a merchant’s daughter to do once she immigrates to a land of opportunity? Why, start a business. Or more than one. Sarah Ocampo was her father’s right hand “man” as he had no older son. She helped manage all his properties, which included chasing bandits who threatened them. She had learned much from him, and it near broke her heart when she decided she had to leave him. Now she can honor him by putting all she’d learned to use. With a WEE bit of help from the librarians of Grantville. The country in and around Grantville is generally peaceful. But there are always some who would rather rob other’s businesses than work their own. They should have left the businesses of “the African Princess” alone. Athena Sarah Mawusi Akwete Ocampo received an arrivalday gift which made her tear up. It was a Ruger .357 Magnum revolver with a six-inch barrel. Arrivalday was an increasingly celebrated day for down-timer Grantvillers. Many didn’t know their birthdays–or didn’t want it generally known. A good many were former mercenaries or bandits or political or religious refugees who wanted to remain anonymous. Arrivalday, the day they’d arrived in Grantville or its outlying areas, were for many of them a day of rebirth more important than their biological birth day. That so many were possible criminals didn’t usually bother up-timers. As long as they hadn’t done anything really bad like commit atrocities, former West Virginia natives were cool with their past. After all, many of them, especially the hillbillies, had had their own scrapes with laws for such actions as moon shining and mild tax evasion and growing and selling weed. Or they had ancestors who’d been criminals. Indeed some up-timers bragged about just how terrible their awful ancestors were, so many that some perfectly white-bread up-timers made up outlaw ancestors. Sarah took the pistol out of the box from her sort-of grandfather Bill Straight with the care one might handle a jeweled crown. Indeed, its jewel-like precision and subtle blue-black sheen invited the comparison. Sarah was a deadly warrior who had a rep back in the West African port city El Mina and its surroundings where she’d grown up. There she was known as the White Panther. Here in Grantville what they knew was that she’d killed more than a dozen bandits on the last leg of her journey to Grantville. Too, in the last year she’d killed more, as she set herself up as the head of the Athena Security firm with three other dangerous types. She was a rich woman but knew her fortune would not last forever. Besides, she was an active type and not made for an idle life. With almost the same reverence Sarah took out the heavy box of .38 Special cartridges. Such were increasingly rare items and were almost literally worth their weight in gold. Also in the box were a cleaning kit and a small bottle labeled Hoppes #9. She jumped up from the chair in the Safarelli House boarding room’s event room where her arrivalday party was being held and hugged the old man, his whiskery face scratching her cheek. He felt alarmingly frail within her arms. Sarah kissed Bill’s check, sat in her chair, and opened another box. Inside it was a small solar powered calculator, quite old but still functional despite being nearly 40 years of age. Sarah complied. Olivia was reassuringly solid. She’d once been portly but few up-timers ever remained that way. The first two years after the Ring of Fire delivered Grantville to the 17th Century had been very lean ones. The habit of eating sparingly had remained after the area recovered from its crops devastated by war. The next two presents came in the same box. They were two throwing knives: eight-inch blades with thin glued-on hand grips. They were from the Weber Twins. Nobody knew if they were sister and brother, cousins, or lovers. They were both sturdy and pleasant-faced and ever-polite, but they were deadly fighters with long experience. They never spoke of their Ring-of-Fire past, but Sarah had had no problem accepting them as two of her three partners in her security firm. She thanked them, then asked where Aramis was. This was her third partner, a dapper Frenchman whose past was equally obscure. Obscured by his many fantastic and occasionally convincing tales of a sordid and adventurous past. He’d taken the name of one of Dumas’s three musketeers in lieu of his real name, whatever it was. Sarah opened it carefully to keep the beautiful covering paper intact. Inside it was what looked like a red rose. It was a beautifully realistic fake with a nearly invisible clip which one could use to attach it to one’s hair or clothing. It perfectly expressed Aramis’s love of ironic jokes: lovely but something Sarah would never wear. She never adorned herself in stereotypically feminine fashion. In an act of defiance she clipped the rose to her hair and accepted the remainder of her arrivalday gifts. They were mostly small things and came to over a dozen, from a couple of Bill’s chess-and-checkers friends, Safarelli House friends, and a few teenagers from Grantville High School who had taken the coffee-au-lait African goddess as one of their heroes. Gifts given and duly opened and appreciated, the party started with access given to the table of snacks and drinks. In all another dozen people participated, some actual acquaintances and some strangers ready to celebrate almost anything if free food and drink were included. The next day Sarah, Bill, and Olivia met for lunch at the Golden Arches, which used to be McDonald’s, at Olivia’s request. It was near to Olivia’s home and quieter than at the taverns. Not that its dining area was quiet. The business had gone through three ownership changes after the Ring of Fire, and had been stripped of much of its portable facilities. The latest owners were the most successful. The inside dining area in evenings was so in demand that reservations were required. Olivia was a favored guest since she did their books, but even so she reserved a table in the middle of the week. Weekends were so in-demand that reservations were made days or weeks in advance. They began by drinking iced tea while their order was prepared, an expensive drink because it required refrigeration to make the ice. Olivia began the serious discussion that Sarah expected by gazing at Sarah. The phrase apparently meant something to the two up-timers. Sarah told Olivia to explain, starting with what the phrase meant. “One of the more successful examples back up-time was the work of an Australian named Rupert Murdoch. He started with a newspaper he’d inherited and made it more profitable by, among other practices, publishing scandal stories and stories about celebrities. He bought more newspapers, ending up eventually with dozens of them. One practice he adopted was to share stories among his various papers of events of national as well as local interest. Written once, used often. “He expanded to other countries. As TV became more widespread he expanded into that. Then into movie making. Then as digital communications became more widespread into that. She held up a hand as Olivia started to say something. “Nothing wrong with that. In fact, I like it. My father–” She paused a moment. She still had not heard anything from him despite sending him and her family back in El Mina three long letters about her stay here in Grantville. The word “nerd” after the Ring of Fire had acquired a patina of respectability in the Germanies. It was sometimes still used as an insult to mean someone socially awkward and obsessively studious. But Germans in general approved of obsessive workers, as did most people who lived on the edge of starvation and ruin. Nerd was GOOD. “She had written a paper on it for a college class up-time. She said that printing was just part of publishing. In fact, most publishers didn’t own printing departments. They contracted printing out to printers. Olivia was frowning, from thought not disagreement. “I suppose… We could work publishing books into our overall plan. Sarah laughed. “OK, we won’t.” She looked at Olivia with mischief in her eyes. Olivia looked as if she were trying to get out of the job. Olivia reluctantly accepted that to get Sarah to take her advice she’d have to become a CEO. Never one to put off unpleasant necessities she went right to work. Sarah and Olivia started by visiting a lawyer who was expert in corporate law. For a couple of years after the Ring of Fire there’d been corporation fever in Grantville and beyond. Up-timers left and right and energetic Germans aplenty had created all sorts of good and many more bad corporations. Then the inevitable failures occurred and the boom in corporations burst. Leaving the successes as lessons in planning and good management. The attorney showed the two several standard forms and explained them. Sarah chose one and the attorney and Olivia helped her customize it. With a corporation in existence on paper the two retired to Olivia’s apartment to plan further. Olivia brewed tea and they set to work in her home office. Olivia said they should first rough out the overall business, which they’d named Athena Enterprises Corporation. It would contain all the businesses which Sarah might eventually create or buy. A logo was essential, she said, so that the public could easily recognize the company. She suggested the initials AEC drawn inside a square, or maybe typed as [AEC]. This would go on the company letterhead and, writ large, on the front of any company buildings which they might acquire. Sarah liked the image, but suggested they tilt the box to the right. This would suggest that it was moving like an automobile, not just sitting upright like an unmoving building. Olivia suggested a further shortening to just [A] or if italicized [A]. Sarah argued for an E, for Enterprise, inside the box, but Olivia was firm. Sarah had already created her first business: Athena Security. Olivia suggested an italic capital A surrounded by a stylized shield. Sarah was adamant that the letter should be an S.
“Speaking of pots…” Olivia got up to reheat water and make more tea. She brought cookies back to the work table to sustain them. “OK. Now…” Olivia crunched on a cookie and thought. “And digital,” Sarah put in. She was fascinated by computers and wanted one. Unfortunately nobody was selling. Olivia suggested Athena Communications for the news and entertainment corporation. Sarah shook her head. After some discussion they came up with Worldwide Communications Company. Sarah snickered. She’d seen all three Star Wars movies and loved them. That silliness demanded more tea. Olivia got up to repair the shortage. It took some brainstorming, but finally they created a logo of an italic capital C with a horizontal double-headed arrow through it. You could type it as <–C–>. Next Olivia roughed out an organization chart. It came to almost twenty boxes arranged in an upside down tree structure. Sarah was appalled. That done they called their Senior Research Consultant to have dinner. Choice of place his but he had to pay for it if he wanted to know what they’d decided on today. The next morning Sarah had breakfast at Higgins Hotel as she often did. A fair number of business people in the several blocks surrounding the hotel did. The day was Wednesday when she also scheduled a weekly Athena Security meeting at one of the smaller conference rooms in the Higgins. She was joined by the Webers and Aramis. They talked about no business during the meal as Sarah had long ago decreed. Sarah told of her birthday party. Aramis told a tale of his latest assignation, which the Webers listened to skeptically. Business speech was reserved for the business meeting when they retired to the conference room carrying a last cup of coffee or tea. Sarah ushered her partners inside and closed the door, causing Aramis to raise his eyebrows. They all saw why when she opened her briefcase and brought out her newly acquired pistol. “Bill’s birthday present,” she said as she opened the six-shot cylinder and removed the rounds inside it. Bill had given her a brief lesson in handling the weapon. He’d then given her a thin little booklet. It had contained diagrams and instructions on how to disassemble and reassemble the weapon and otherwise take care of it. She carefully clicked the cylinder closed and passed the pistol around. Aramis examined it first with the Webers watching closely. Then he handed it on to them and spoke to the air. Aramis on duty wore a cap-and-ball revolver on his sword belt across from his rapier. Both of them had been surrendered this morning to be placed in the locked vault near the reception desk. He was expert in both weapons and had taught Sarah how to shoot. Gina Weber was the last to handle the weapon. Like the others she’d pointed it at various targets in the room. She handed it back and Sarah reloaded and replaced the weapon in her briefcase. Gina said that the Webers had successfully carried out their latest bounty hunter assignment. Aramis, a budding computer hacker, said he’d investigated the theft of proprietary information from a company which suspected they’d been hacked electronically. He’d found it was simply a case where a clerk had sold the information to a rival. He sounded annoyed. He’d been spending a lot of time with computer nerds at the high school and elsewhere and dearly wanted a chance to exercise his newly gotten expertise. There were a very few small nets in Grantville and its two major satellite cities, Badenburg to the west and Rudolstadt to the east. They were based on equipment brought from up-time, but a few forward-looking nerds were working on down-time versions. Sarah’s comment segued the talk into her new “media empire” enterprise. Gina said all that would be a lot of work. “That brings us to us. I’ll not be going on the road a lot. We need a fourth partner to take my place. Start thinking about who that could be. Start. We want to be very careful who we bring in. All four of us have to approve of him. Or her. Bring back suggestions to our next meeting. There was little need for his protection, though it was always possible SOME idiot even in the peaceful and well-protected area around Grantville would try to rob someone. It was more a prestige thing for “Dame” Edith, a rich merchant’s wife, to have an armed guard, especially one so flamboyantly and attractively French. Sarah’s next stop was a leatherworker recommended by Aramis, whose holsters had been crafted for him. Sarah gave instructions to the crafter based on her experience with Aramis’s holsters and her own taste. This included some ornamental stamped figures on the outside, but simple and “tasteful.” Placing her pistol atop a piece of paper he drew its outline and made some notes on the paper. He gave her an estimate of how much the job would cost and when it could be delivered. She arrived at the Grantville High School an hour till the cafeteria opened. She spent that time reading a history text about the growth of American and other businesses. She especially focused on “conglomerates” and other such large organizations. Among other information, the text echoed Bill’s comments on the limits of synergies, but also Olivia’s comment that conglomerates had to be built for the right reasons and managed well. She was at the door of the cafeteria when it opened and among the first to go through the serving line. She called out Hellos to the serving staff, who answered back to the familiar figure. She got “her” table: a big round one in a corner with a good view of the entrance. A couple of nerd girls were already sitting there. This was no surprise: they were part of her fan group. Other students quickly joined the table, including jocks. She had her fans among them, too. After all, she was a jock too. She was also a sports fan, coming to a lot of the games and cheering as loudly as any other enthusiasts. A teacher walked by chatting with two other teachers. Sarah called out to him, “Hola, Tejano.” Jose Hernandez was the high school Spanish teacher and from Texas. He also had a linguistics degree and she and he’d had many discussions about the African languages she spoke. The discussions had often been at the home he shared with his wife, Monica. He turned toward her, then back to his companions, telling them he’d join them shortly. They chatted briefly, still in Spanish. Sarah thought it set a good example for the high school students and thought (rightly) that her friendliness enhanced the teacher’s reputation. She also spoke in French to the school’s teacher of that language. After he’d rejoined his companions and near the end of lunch Sarah spoke to the whole table. There was general laughter at that as everyone got up to go to their first afternoon class. Back in the library Sarah asked the librarian about a book called The Maltese Bird. The woman smiled. She walked off and came back with two books. One was an up-time hardback titled Dashiell Hammett: Complete Novels. There were five titles listed on the cover page, including the one Sarah had asked about. The other was a smaller paperback book printed by a down-time printer. The front page was crude: a red hawk outline viewed from the side, with the author name and title superimposed. She opened it, carefully, because the whole thing felt flimsy. She started to read. She could hardly get halfway down the first page before the crudeness of the writing made her quit. “Hmm. Lots to think about. Let me change the subject. “That’s where the Technical College comes in. They’re just down the road that way.” She pointed. There was a guard at a desk just inside the administration building. Sarah said she wanted to get information about starting a business. He made a phone call, said someone would see her now, and told her she’d have to leave her weapons with him. Sarah gave him her staff, asked if she could also leave her briefcase with him, and followed the directions down a hall to an open office door. The office was fairly large with several bookcases full of books. Behind a desk sat a young woman of about 30 dressed in business formal for women, which to Sarah’s sensibilities bordered on informal. She rose and put a hand out over her desk. Sarah shook it and sat in the indicated chair of two before the desk. The woman, Diana Mora according to the name on the metal plate on a block of wood on her desk, just surveyed Sarah for a moment. She surveyed back. A princess in the TV shows and movies Sarah had seen was someone dainty and pretty. She grinned at the idea she was one of those. That got a smile from Diana. “I didn’t even know this college existed. Even more important, I needed a general education before I started on specifics.” That had been a point her father had made to her very early: look at the big picture first, then the little pictures. Why hadn’t he written back to her? Was he dead? Still mad? “Hey, I’m not just a knuckle dragger.” She grinned. She’d heard that particular insult, listening to two high-school football players playfully insulting each other. Diana leaned back in her chair and tilted her head, studying Sarah as she went on. “When I first arrived and discovered this library I was delighted. Then I became depressed. So many books! I could never read them all. “No. Conglomerates. I’m starting a ‘media empire. '” She made quote signs with her fingers. The woman spun her desk chair to the left and right while she stared at the ceiling. She stood. “One thing. A basic lesson every boss has to learn. You can’t get too caught up in details. You must find good people, trustworthy people, give them some very clear GENERAL commands, and let them surprise you. Those were half a dozen, caught between classes or otherwise free. All were interested in her problem but could spend little time on it other than being willing to answer questions some of the time. One man loaned her a fat textbook and a slim one, charging her a big deposit for her to keep them for a limited time. If she didn’t return it by the due date her money would be forfeit and she’d be assumed to have bought them. Sarah thought this was a sneaky way to sell books. Both had been reprinted by local printers from copied up-time texts. She didn’t mind sneaky as long as it didn’t cross over into cheating. She might even use this tactic herself in her publishing business. She ate at the Higgins with a few business “friends.” She was following her father’s practice of building and maintaining a wide network of scratch-your-back associates. Then she watched the evening’s movie in the hotel’s viewing room, a VCR recording of two back-to-back episodes of Star Trek. When she left two groups were arguing Star Trek versus Star Wars. She stayed up late skimming the fat textbook, getting a field for the “forest” (as Olivia called her father’s big picture) before descending into the “trees” of details. She spent the next few days browsing the Technical College library for business topics, sharing lunch with college faculty and students, and having dinner at the Higgins restaurant and the Golden Arches. Most times she watched the early or the late-night movie at the Higgins, then retired to her boarding house to read. Of the several books she’d borrowed or bought the one that was most useful was the slim one she’d bought early on. It was titled How to RUIN Your Business. At first she’d thought it was about RUNning a business even though the middle word was in all caps. Instead it was all about the many mistakes a business person could make with her business. One lesson was the need to be prepared beforehand to fight off competitors. A lesson which was almost immediately useful. For Olivia showed up at a Golden Arches dinner with a legal ultimatum. “These effing a-holes want us to shut down our publishing house!” She was waving a piece of paper. She was clearly angry though not so much she didn’t edit her curse words. Bill hated cursing, especially by women. Olivia had a tendency to curse. He took the paper, glanced at it, and handed it to Sarah. It didn’t take her long to understand: three of the several local printers had gotten an attorney to send them a warning to cease and desist all printing activities that would infringe upon their rights. Olivia was threatening to counter-sue. Sarah disagreed. “Long experience in the African bush, partly. But Yes. Here’s what we can do.” She explained. Halfway through Bill began laughing. The three met the three printers who were threatening to sue in a conference room in the Higgins at 2:00 in the afternoon. They came alone. The printers came with, seemingly, an aide each and one or two family members, including an older and a younger woman. The oldest of the printers took one end-seat of the long oval table, another tried to take the other end seat. Sarah was behind the chair at that end as the man approached it, her hands on the back of the chair. She did not pull it out. Instead she turned and offered a hand to the man. He had to look up to her. A moment of hesitation, then he smiled back, shook her hand, introduced himself, and retired to sit to the right hand of the man at the other end of the table. Olivia showed up a couple of minutes later. She’d been waiting in the lobby chatting with Bill, neither seemingly noticing the printers’ party walk by. The stage now set, they made their entrance. Everyone’s eyes turned toward them as they came into the room, the end-seated man having to twist in his chair and turn his head to see Bill ushering Olivia in ahead of him. She nodded at him and strode in to approach Sarah, who pulled the chair out from under the table. Bill then took over and pushed the chair forward a bit as Olivia finished seating herself. Bill took the seat to her right. Sarah ambled down the table on Olivia’s left and settled herself two seats down. This put her next to the older of the two women. She smiled at the woman but turned her head toward Olivia. Olivia and Bill were dressed in up-time business attire, Bill’s suit black, Olivia’s suit light blue. He wore with it a white shirt and blue tie and shined black shoes. She wore a lilac blouse opened at the throat. Sarah wore blue jeans, tennies, and a tee-shirt with the logo of an up-time rock group on its front. She pushed her chair back enough so that she was able to slouch in her chair, her crossed legs out from under the table. The leader of the printers spoke up so everyone could hear him. The room was small; he did not have to speak very loudly. Only someone who knew Bill knew that his frown was keeping him from grinning at her performance. “Oh, very well,” Olivia said. “We wouldn’t want to keep you from that important task. “Now, Mister Fiedler. We were very happy to receive your attorney’s letters. We immediately knew you weren’t serious, of course. Grantville’s, and Thuringia’s, courts would never entertain such a restriction in trade. So we knew this was the opening of bargaining for a position at the table of the big business we have planned. Let me tell you what we’ve planned and we can discuss just what part you would like to play in it. Olivia went into her brief “synergy” speech, then segued into her “publishing is about much more than printing” speech. Sarah pretended to yawn and got up to amble out. Later the three had lunch in the Higgins. Sarah asked how it went. Sarah filed away the idiom as Olivia protested. “Go ahead, be modest,” said Bill. “It doesn’t suit you, but what do I know. I’m only a retired coach. After listening to the two for a while Sarah grew satisfied they had the issue of printers for their publishing company well in hand for the time being. They had made a list of all the printers within a hundred miles and begun building a catalog of their facilities and practices. As she excused herself they’d just begun a similar list of newspapers to buy or to buy stock in. Another matter had been pushing itself to the fore of her attention: book publishing. And she knew just the right person to go to deal with that business. Her name was Barbara Reed. An occasional substitute teacher, she supplemented that meager income by working as a librarian at Grantville High. She was one of the several librarians who worked there, usually in the evenings because the off-hours paid a bit extra and her husband was out of town in Erfurt for most of the month. A hand waved at her from the side a safe distance away. All her friends had learned soon after they’d become friends not to startle someone as alert and ready for danger as Sarah. It was more like an hour and a half when Sarah’s friend returned. Sarah closed the textbook gently and carefully returned it to its location on the bookshelves, then followed Barbara to the front desk where they could talk and Barbara could keep an eye on things and be available for questions from other library patrons. “You’re the next CEO of…Athena Publishing. Athena. The goddess of wisdom. Appropriate, don’t you think? Barbara was looking stunned. Luckily for her composure an older man came up to her desk with a question. When she returned from the stacks Sarah was doodling on a piece of scrap paper from the reception desk. She pointed at the two versions on the paper, one the typeable version, [A], one the graphical version. Barbara puzzled over Sarah’s scribbles, then began vigorously scratching them out. Then she drew her own: [L] and its graphical version. Sarah, who knew Latin, though not as well as she’d like, marked out Libros and replaced it with Libris. At 10:00 on a Saturday a week and a half later Sarah, Olivia, Bill, and Barbara met in one of the conference rooms at the high school, which rented it and other facilities to carefully vetted outside groups on weekends and evenings. With them were a couple dozen students interested in books and publishing, some of whom hoped to earn a little money helping with various activities. This including jobs such as copy editing and translation, as there were some students who were fluent in two or even more languages. There was even one prodigy who knew a dozen languages and was nearly a poet in all of them. Attending were also some concerned or merely curious parents, the members of the romance discussion group, and various other adults, including the three, count them, three published writers. Sarah started the meeting by standing up on the podium at one end of the room and waving her arms above her head. Olivia came to the podium and Sarah left it. Several hands immediately shot up. There was a buzz at that. Olivia didn’t squash it. Instead she called Barbara up to the podium, then spoke loudly enough to quiet the room. She put a hand on Barbara’s nearest shoulder. “Many of you know Barbara Reed as a substitute teacher here at Grantville High. She also often acts as librarian in the evenings. As it happened, up-time she studied the publishing industry extensively. She has been kind enough to give us at Athena advice on starting and running Libris. Barbara adjusted the microphone on the podium and put some notes on it. Then she looked out at the audience. A couple of hands shot up, then a few more. Barbara picked a teenaged girl. “That’s right. What else?” She pointed at a different audience member, an older man who was a parent judging by the teenaged boy beside him. “That’s right. Up-time they found them by looking in a ‘slush’ pile of manuscripts sent to them by someone. After a while they got so many that they said they’d only look at books sent to them by an agent who specialized in representing authors and taking a cut of the money earned by the books. Olivia raised a hand and Barbara nodded at her. Someone raised a hand. Barbara nodded to him. Bill Straight spoke up at that without raising his hand. He was standing nearby leaning against a wall where he could look over the audience. He put on a sour-looking face. There was general laughter at that. Barbara waited till it died down before continuing. “We have said enough that anyone unfamiliar with publishing should now know what we’re trying to do and how. It’s time to listen to you. She knew the three women who qualified and had convinced them to sit near the front of the audience. She looked down from the foot-high dais at them. Hazel McDonnell stood up. Barbara waved at her to come up to share the podium with her. The woman did. Hazel was mid-seventies and retired till the Ring of Fire. She’d come out of retirement to tutor teacher trainees at middle school and technical college. A life-long artist, she’d sold the first of several illustrated children’s books to a Rudolstadt printer. Barbara, with a hand on Hazel’s shoulder, introduced her to the audience, telling them of that. “Hazel, what has been your experience as an author?” She moved aside so that the woman had full possession of the podium. There was laughter at that. She was silent for long enough that Barbara visibly checked herself from taking back the floor. “Now, a few things that aren’t good or bad. Just realities you must know if you set out to be a writer. First, your work may never be picked for publication. Maybe it’s just not good enough. Yet. Or maybe it’s almost too good, more than people are used to and want. “Second, you have to write all the time. Or a lot of the time. The most successful writers back up-time wrote a lot. Every book is advertisement for all your other books. You keep building your readers with every book. “This is true even if you can only work as a part-time writer. Everybody has a personal life that they have to spend time on. You have to make time every day. Or almost every day, to spend a little time on your writing. “I don’t just mean typing or scribbling. A lot of writing is thinking time. It’s dreaming up the material that you type or pen. “OK. I think that’s it.” She abruptly left to return to her chair to sit looking at her clasped hands. Barbara began clapping and Sarah and Ben joined her, then much of the audience. She looked down at the two young women sitting with Hazel. “I want to introduce you to two other authors, Anna Greiner and Elisabeth Müller. Would you feel comfortable coming up here?” That last was a real concern. The two girls had looked daunted at her first words and were holding hands. They were used to talking to groups but to students, being part-time teachers. This was a very different audience. They got up, still holding hands, but had to break when they reached the low dais and had to step up to it. Barbara pulled the closest to her with a half-hug then let go of her. She spoke to the audience to give the young women time to adjust to being on stage. Which they surely did. Perhaps as many as 90% of the audience were down-timers. Though it was sometimes hard to tell. Down-timers who moved to Grantville quickly picked up the habits or at least the dress of up-timers. Women had mostly abandoned floor-length dresses for below-the-knee dresses. Sarah herself had certainly acclimated. She loved tennis shoes and blue jeans, and beige jeans, and brown jeans, and green jeans, and even thought for instants of buying pink and red jeans. One, the blond, said, “I think it’s because women found what they really want from a marriage and books are a sure way to get it.” She looked at her friend, the black-haired of the two. There was laughter after that and the young women relaxed and talked about the art and craft and business of writing. So much so that Barbara had to gently bring their talk to a close. “Thank you, Anna and Elisabeth.” She led applause for the two women. There was considerable applause as she got down from the dais, dying quickly away as everyone headed for the cafeteria. After an hour in the cafeteria most of the crowd had died away. Left were perhaps two dozen people, busy with their food and each other, ignoring the four Libris people. Bill said almost 40 and Olivia 39. “Oh, my aching bank account,” said Sarah mournfully. “I will be a poor woman soon.” Sarah was not about to abandon her tragic role so readily. “Cowshit. You’re one of the richest people in Grantville, what with your income from Athena Security and the sales of your coins. Especially those. The bank has consulted me because of my numismatist background and called me in on selling your collectible coins and there are a lot of them. He and the other two women were rising before Sarah reacted. She rose too and turned to see the cause. It was the Grantville High School principal, Victor Saluzzo. “Please do,” said Olivia. She sat as he pulled a chair over from an adjoining table and sat. Everyone else sat, too. They’d semi-met at high school games and joined everyone else in yelling for the Grantville team. Badenburg, Rudolstadt, and Saalfeld all had high schools now big enough and their teams expert enough to give Grantville tough competition at games. Soccer was the big one, there being plenty of small but agile down-timers to compete with the generally larger but slower Grantvillers. Baseball was popular, too. American football and basketball were less so since Grantville still had height and weight advantages over the others. Tennis and diving were gaining ground. Who didn’t want to see active young women athletes in next to nothing, and young men too? “Is there a problem with them?” said Barbara. Bill and Barbara grinned too. So did the principal. He stood, shook hands all around, and left. The rest grinned at her and turned to a more interesting topic. For the next several weeks the Libris business continued to build. Most employees were unpaid, or the more important ones with miniscule shares of stock. Finally they had another meeting at the High School. Barbara took the dais and the podium and called for quiet. The noise died away. She held up in her hands a book, the face toward the audience. People in the front row leaned forward and squinted at it. “This is Irish Thoroughbred by a popular up-time novelist named Nora Roberts. It is the first of three in a series. We will publish the next two if there is enough interest. We have leading contenders for the first book in each of the other two lines but have not yet settled on one. Each will be by other popular up-timers. The hands went down and Barbara went on. She waved at two teenagers, a girl and a boy. They nodded and showed her they each had a bucket and a batch of paper slips and small pencils. After a pause the two helpers began to do their job. It took a while, as everyone seemed to want to enter the drawing, but finally it was done. The teens brought their two buckets back and Barbara poured them into one larger bucket. She held up the bucket so everyone could see she mixed the slips well. She called a woman’s name and she came up, picked a name, held it up, and handed it to Barbara. She peered at the slip of paper and called out the name. The winner, a man, came up and received a book with much catcalls and applause. “Yeah. Zero!” said someone. Everyone laughed, including the winner, and the remaining winners were announced. As the last noise died down Barbara over-rode the last of it. With much applause and laughter and other noise the fifty or more people left the room. Barbara sat down on the edge of the dais and breathed for a few minutes. She was joined by Sarah, Olivia, and Bill who sat with her. Matters proceeded in Sarah’s life, if not smoothly then with only a few rough bumps. Then mid-morning of one day she got a phone call. She was in Olivia’s home office. Her friend handed her the phone. Sarah did. She’d traveled to Suhl three times as part of Athena Security’s caravan guard duty. “Hey!” The words were faint over the phone. Georg must have an ear close to the phone Gina was holding. Sarah heard Georg complain about that. He and Aramis had a long-running argument, he favoring baseball caps, Aramis the deerstalker. He was especially enfuriated by Aramis’s airy argument that if it was good enough for Sherlock Holmes it was good enough for him. She was silent for several minutes. Then she gave Gina some orders, then got off the phone to phone others and began giving orders to them. She sent two more security guards to Rottenbach, ones who worked full-time, though part-time for Athena, to help the Webers and their helpers finish the run into Grantville. Gina was to stay in Rottenbach to prepare for Sarah’s arrival. Then she made some more phone calls. 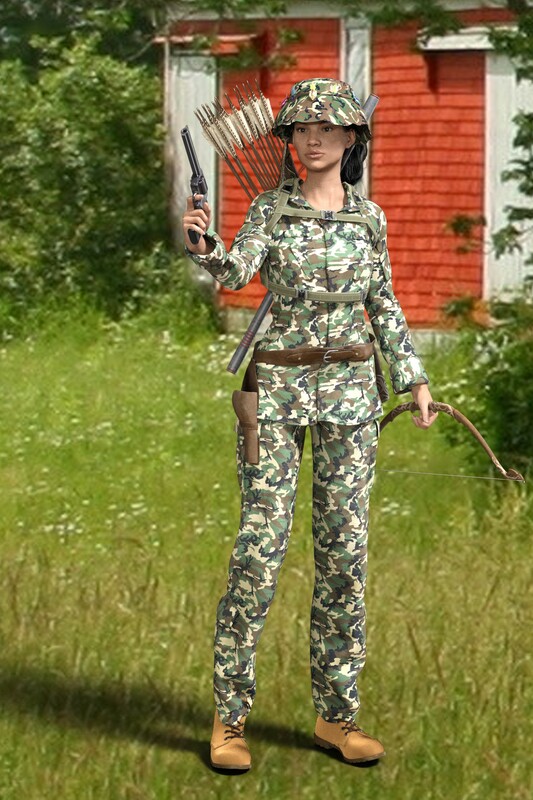 A half hour later she dressed in her complete camo outfit of green and grey pants, long-sleeved shirt, and big floppy hat which covered all her head and most of her pony tail. Sturdy boots finished her clothing. She geared up with straps which held a quiver of a dozen arrows on her back and, in an X-configuration, her four-foot long hardwood fighting staff. Around her hips she slung her pistol belt and its holstered Ruger revolver. In her pockets went extra bullets for the weapon. She slung an extra quiver of arrows over her shoulder and took up her two bows, stringing and testing the strings, then unstringing them. Extra strings went into one of her many pockets. Olivia, who’d come with Sarah when she left for her lodging, handed her a first-aid kit. Sarah slipped it into a pocket in her camo outfit. “Come back safe, chickadee.” Olivia stood up tall enough to kiss Sarah’s cheek, then followed Sarah out to the waiting cab. She stood on the sidewalk watching as the cab pulled away. Sarah picked up Aramis and another security guard, both in camo outfits which were the unofficial uniform for Athena guards. Aramis wore his deerstalker hat, probably because he knew it would annoy Georg. Nevertheless, Sarah considered it a very well-designed hunting hat, with its forward bill to shield eyes from the sun and its rear bill to protect one’s neck from whatever debris or insect might befall it. The two had various distance and close-up weapons. Aramis favored two cap-and-ball revolvers in cross-draw holsters and extra loaded cylinders in his pockets. He carried a 30.06 bolt-action Springfield rifle and his rapier, which would be slung over his back when they left the cab. Mateo Torres had a Mossberg 12-gauge shotgun and buckshot cartridges and a billy club. The trip northwest on Hwy 250 was brief. The border created by the Ring of Fire was only three miles away. Then the cabby drove the few hundred yards to Rottenbach because the several-times-upgraded road was as easy on car tires as 250 was. She took her fares and wished them Good Hunting. Then she drove on to the hotel/motel where she could pick up other fares for a return to Grantville. Rottenbach, a village terribly small before the Ring of Fire, had expanded much in the last five years. This was partly because it was now the Door to the West. This included Badenburg only ten miles away, and partly because it was the main embarkation point to Ilmenau and Suhl and other points to the west and south. And to Frankfurt, where Sarah intended to go to the next book fair. Sarah and her companions met their compatriots at a stable where their animals were being watered and fed. The Webers were diffident until Sarah greeted them with a cheerful Hello and got right to business. Gina said they had. Sarah left Torres to guard the three wagons parked outside the stable and the Webers and Sarah and Aramis went to the nearby inn. There they joined the two other guards on the Suhl trip, Phillipe and Jean-Luc, and the three wagon drivers. Over drinks and snacks Sarah had all the Suhl travelers recount the attack in detail. One new fact came from one of the drivers. Left were Sarah, Aramis, and Gina. Torres came in after the Suhl caravaners had left and sat, ordering a beer. He nibbled on the remains of the snacks on the table. An enterprising down-timer named Rudolf Goldschmidt had been impressed with bicycles and especially the few makeshift trikes created by adding on salvaged parts of other bicycles. Those were especially popular with older people, as an exercise option to “keep them young” and carry groceries and such. He’d bought every bicycle people would let go of, hired a couple of workers, and begun making trikes. They sold well enough for him to expand. Gina led them to a nearby wagoneer’s lot. It was big, with wagons of all sizes from large ones to lighter ones: buckboards and buggies and the like. And trikes. Sarah had been teased into trying some by teenaged friends. She especially liked the ones with tiny motors. Some could get up to a blazing 15 miles an hour or greater. But they were loud. She pointed this out to Gina. Sarah remembered the terrain going to and from Suhl very well. On a horse you had plenty of time to observe the country, especially when you’re supposed to be alert to attack from out of it. The Spaniard was as about as far from the stereotypical excitable Spaniard as it was possible to be. He said Yes. Aramis was not to be outdone. He said Yes too. Shortly they were mounted on rented (“with an option to buy”) trikes and set off down the trail to Königsee. It was an easy ride at first. The roads leading away from Grantville had gone through several upgrades over the years, starting with almost none to improvements good enough for automobiles and trucks and their precious tires to ride on. It was not quite 10:00 and the day was still cool. To their left, eastward, the hilly land opened into more or less flatland. Also to their left was a tiny stream with its guardian bushes, a pleasant sight. To their right, westward, forest on hillsides crowded the highway. The tires of the trikes made a quiet shushing noise. Ten minutes later the road turned from south to southwest. Gina had them slow down and stop. She got off her trike and spoke to Sarah. Sarah told everyone to stay with the trikes. She got off hers and walked slowly eastward where a long grove of low trees paralleled the road. The grove was perhaps a quarter mile long. They were near its south end. From it exited the little stream with its bushes to each side. She looked down the very slight slope. She could see all the way to Königsee, about two miles away. A good place to spot the caravan coming toward her location. She walked slowly to the bushes on the stream. Several minutes later, walking very slowly and looking at the grass at her feet and nearby, she spied the first signs of the ambushers. They were grass only just folding upright from being stepped on, a few leaves rubbed off bushes, and a few scuffs of barer earth. They would have been unnoticeable by most people but were obvious to someone who’d been taught by African bushmasters from childhood. First slowly then more surely she paralleled the caravan ambushers. Once she saw a bush whose topmost limb had been scored by a bullet. The “ambushers” had been firing high over the heads of the caravaneers. She left the bushes and the road side. Gina had been walking between her trike and Sarah’s, guiding both of them. She mounted her trike and told the rest of her party what she’d found. This was about a quarter of a mile, a long shot even for sharpshooter Aramis, another clue that the shooters had not intended to hit anyone. The signs of the ambush were clear. Sarah looked around. Behind them, to the south, the land was mostly flat. To the west the road had turned more till it ran almost directly west. To the north, in front of her, there was a flat area between two hills about a quarter mile wide. Beyond were more hills, reaching higher. Gina said the thieves had gone that way. Sarah agreed. The signs of two mules were distinct. There were also signs of two horses. They mounted their trikes and followed, pedaling still. There was a flat earth-packed road leading northwest between the two hills and the upward tilt of the land was slight. Beyond the two hills the land opened out into a flat area about a mile wide and three miles long. There were a few scattered farms holding cattle and sheep. Near the center of the area was a small general store behind which was a large pen of several chickens and another for pigs. A couple of houses bracketed the store. They parked their trikes and went inside. There was a woman behind the counter on the far side of the dim room. A man was doing something to a shelf, stocking it or just rearranging merchandise. Gina, who was German and whose German was best, greeted the woman and went to talk to her. Aramis asked the man if they had beer. Sarah silently doubted that but joined Aramis and Torres in buying a big mug each. Approaching Gina, taking a swig, she also bought a double handful of cookies from one of the several jars and folded them into a large clean handkerchief which she also bought. Back outside they sat on a bench and finished their beers. Sarah shared the cookies around. Aramis, who’d stayed behind a few minutes, waved off his share and showed off a fistful of several sticks of smoked meat. He experimentally took a tiny bite of one, then began to nibble on it. Torres said that their “friends” didn’t seem like professional thieves. Aramis said more likely they wanted to get further away from the scene of the crime before investigating their plunder. “Just what was in their ‘plunder’?” Aramis wanted know from Gina. Aramis shook his head in disbelief. Then he got a mischievous look on his face. He hauled out of one of his pockets a small paperback book and handed it to Sarah. She examined it. It was poorly done and fragile, the pulp paper badly yellowed. Sarah, who had a reading addiction, did believe it. She’d sooner go hungry than go bookless. She stood up, slipped the book into a pocket, and went to her trike. The valley ended two miles further as more hills rose up before them. The path had become too bad for the trikes to follow. This is where horses would have been a better choice. Though not for long, perhaps. The path seemed to diminish into the thick forest ahead of them. Sarah looked at him sharply. He shut up. She gestured at them where to cache the trikes, off to the side of the slight path. Gina took Sarah’s trike while Sarah took a bow from its slot on her back harness, strung it, tested the string, all the while looking about. She nocked an arrow. Then she walked slowly along the path, looking and listening with all her long years of moving through bush and forest. Every once in a while she stopped for several minutes. The forest seemed to close around her. To greet her almost, though she knew this was a fantasy. She moved deeper into it, near but not on the path. It became ever more rough and invaded by bushes. This made tracking her prey easier, for hairs were pulled off mules and horses. Once she even found a long blond hair, clearly not from an animal. A hundred yards in she stopped near a tree and stood as near absolutly still as a human could. Only her eyes moved and, very slowly, her head turned to left and right. She stood that way for at least a half hour. In that time she became one with the forest. She felt the long slow movement of the trees with the wind in their tree tops. Heard the trunks slowly shift position, their branches murmur, their leaves chat in barely heard whispers. The forest seemed to open out. She could see further, hear sounds from further. Birds spoke back and forth. Squirrels made tiny complaints and comments. Once a rabbit hopped out of a cluster of longer grass, stopped and looked about, its tiny nose twitching. Sarah looked away from it lest it detect her thoughts. There were no ambushers. Had not been for a long time if ever. She ghosted back through the forest, still near but not on the path. Her feet in their tough boots avoided dried sticks and leaves without her guidance. Near where her party waited she clicked her tongue twice. Gina, who with Georg had been with her longest, clicked back. Sarah slowly lifted a hand and gestured Aramis and Torres to follow Gina, Gina to follow her. They did, almost as silently as Sarah. Gina kept about thirty feet behind the ghost ahead of her. All of them were ghosts in their camouflage clothing. For an hour, or maybe twice that, they went up and down slight rises in land which added up to more height. The green of the forest changed, became darker. Then for another hour or two the land sank and the forest’s colors became slightly yellower. Sarah heard the voices first and slowed her pace, raising a hand though not quickly. Everyone slowed to a stop. The voices were faint. There seemed to be no strong emotions in them. More like an idle conversation. Sarah moved on. The others followed. Sarah came near enough to the clearing to see it though the trees. She moved near a tree and the others did the same in a V with Sarah at the point. Torres, farthest back by automatic decision not discussion, was the one who kept eyes on their back trail. In the clearing was a house, a faded red. The voices were coming from the other side of it. The small party of hunters drifted to the right and then around the house, staying several feet inside the greenery around the oval clearing. Sarah stopped where she could see the front of the house. Her companions moved closer but stayed yards away from her. On the porch of the house were two rocking chairs. They were occupied by an older man and a younger man. Sitting on the edge of the porch was a teenaged boy, very skinny. In the yard a boy of perhaps eight was throwing a ball up and catching it. Sometimes he caught it straight on. More often he leaned far to one side or the other. Once he even bent over and caught it through his legs as it came down behind him. He tried that again and failed to much hilarity. Sarah saw only a rifle leaning against the door jamb. She looked at Torres, farthest from her and barely able to see along the side of the front of the house. She held up a finger, made a gesture as if holding a long gun, and raised her brows. He shook his head slowly, raised two fingers, and pointed. Clued in, Sarah saw a shotgun lying beside the younger man’s chair, nearly hidden by the chair’s rockers and his legs. She looked at the two other companions and made the long gun sign again and raised two fingers. They nodded back at her. She pointed at Gina and Aramis, pointed back to the rear of the house, made a circling motion of her arms almost as if to hug someone, and curved her hands toward her body. She made a pulling motion. Gina nodded her head. Aramis frowned then nodded his head. The two were to go into the back of the house and herd everyone out the front door, shooting anyone who resisted. Sarah clipped the grip of her strung bow onto her gun belt opposite the holster. A jerk and it would be in her hand again. She caught Torres’s eye, pointed at herself then the path she’d take out of the forest. Then she repeated it with him. He nodded. As soon as she heard a scream and loud commanding voices she moved quickly forward. The people on the porch had their attention on the front door. The younger man stood, swaying, the shotgun in his hands. Out of the door burst a teenaged girl, an arm around another girl of perhaps ten. Behind came an older woman and a younger. They halted just outside the door, hands in the air. The teen girl shrieked. “Uncle! Uncle! Don’t do anything! It’s her! It’s her! She’ll kill us all. She’ll kill us all!” She was pointing with her free hand. The men and the boys looked behind them. Sarah stood before them like some leafy denizen of the forest, half tree and half human. The black revolver in her hand had no origin in a leafy vale, however. It clearly came from some black metallic Hell. The girl had spoken in German. Sarah responded in kind. He did as he was told, nearly over balancing and falling. Clearly, from his actions and the wine bottle beside his chair, he’d been taking too much advantage of his “plunder.” He straightened, his hands in the air. Gina must have prodded the older woman in the back because she jerked, then came down off the porch to sit on the ground as directed. The rest of the females joined her, the teen girl giving the ten-year old a brief hug before putting her hands atop her own head. The males joined them, the teen boy helping the older man who was even unsteadier than the younger man. The two men might have been pretending to be worse off than they were but the three empty wine bottles and the scent of alcohol on the men and the teen boy were evidence that any pretense was slight. To Gina Sarah said, “No one else in the house?” Gina shook her head. Nonetheless Sarah entered it followed by Aramis. They looked everywhere carefully but there were no places to hide in or under. The beds, for instance, lay on the floor. Sarah was struck with how clean everything was, even though the house had clearly been lived in for a long time. The cubbards were bare of almost all food, the “plunder” painfully obvious in its aloneness. This helped explain the almost skeletal appearance of this family or possibly two unrelated families. And their crime. They were on the edge or beyond of starvation. Two facts struck her. The utensils in the kitchen and its drawer were clean and arranged very neatly. The older women were trying to maintain a proper household. And the bedrooms where the children must have slept had a cache of pulp paperbacks on the floor near a wall. They too were arranged neatly. Back outside Sarah told Aramis and Torres to get the men up and to packing the mules and the horses. They went off the to rickety barn to do so, the young boy insisting he could help. Sarah and Gina returned the females to the inside of the house to pack up all personal effects and everything else in it. “My kitchen?” the older woman wanted to know. “Of course. Books are important. And you, be sure to bring your doll.” This last was said to the ten-year old girl. Suddenly the two girl children were happy. They skipped out of the room. “Food?” The younger woman’s eyes grew large. It took well under an hour to pack everything, there was so little of it. The two teenagers were assigned to lead the mules. After all, they’d done well at that job despite mules’ generally individualistic nature. The two women rode the men’s horses, clutching at reins. Behind them rode the young boy and the young girl, holding on for dear life. Not that the horses were likely to bolt anywhere, being older and plodders. The two men walked, carrying their rifle and shotgun, minus their loads. The four Grantvillers stayed well out of reach of any use of the weapons as bludgeons, but otherwise everyone would seem to the world as a big not-so-happy family. The trikes were a revelation to the thief family, especially once they were on the road toward Rottenbach and their tiny engines were started up. The horses were nervous at the sounds but were such nags they settled down quickly. The mules were blasé, though they continued to eye the trikes with jaundiced eyes. At Rottenbach Aramis and Torres were told to finish the transport of the mules and their burdens to a pre-designated warehouse, the extra burdens of the thieves’ property and the men’s two weapons to be stored at the warehouse. The thieves (now “my friends the Rohrbachers”) had a meal, a meager one. Sarah told the older woman, Gurda, it was her responsibility to ensure no one made themselves sick by over-eating. Meanwhile everyone was watched over by “my friend” Gina while Sarah arranged overnight lodging at the inn. Then the eight “friends” were taken shopping for a change of clothes and footwear. They returned to the hotel with their burdens, then were sent to the baths awaiting them to appear scrubbed and pink a while later in their new outfits. The little girl twirled before “Aunt Sarah” to show off her new pink dress and soft shoes. Nixie, the teen girl, shyly showed off her blue (“like the sky”) dress too. The teen boy and younger boy were not to be outdone by mere girls. They showed off their new clothing too. It was still early in the evening. In the guise of “keeping everybody busy” the Rohrbachers were treated to the nightly show at the inn. In this case it was a rock quartet with a lead guitarist and a female singer. Afterward Nixie and Frida, the little girl, both proclaimed they were going to be singers some day. They definitely could. The boys were equally eager to learn to be guitarists. The two families, reeling with exhaustion and excitement and a long day, went to their two family rooms. Sarah and Gina retired to their “business” room with double beds and glasses of wine and beer respectively with their room service meals. “Think they’ll run away?” Sarah said. Sarah laughed, though sobered when she wondered what Bill and Olivia would say to her. To Hell with it. She finished her glass of wine and got into bed.